To begin planning your golf tournament at our Lake Arthur Golf Club, just fill out the form on this page. Our General Manager will contact you in short order and answer all any questions you may have. 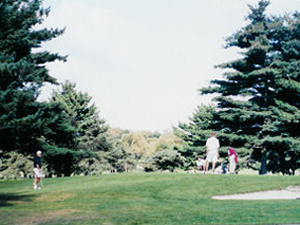 Lake Arthur Golf Club in Butler, PA is the hot spot for golf events in the area. Many local businesses and organizations host their outings and tournaments at our facility annually. Whatever your needs, we are equipped and ready to serve you. Lake Arthur Golf Club is a full-service golf facility. From the standard outing packages which include green fees and cart fees, to the wonderful menues from our in-house caterer, we will address all your needs. When it comes to golf, our professionals know just what it takes to conduct a smooth event. Their years of experience will be evident from the moment you begin planning your event. All reservations must be confirmed 30 days prior to the event, and the number of golfers must be confirmed 7 days prior. A list of the foursomes in your group and the tee-off order must be given to the Golf Shop 48 hours prior to the event. Green fees and cart rental are for 18 holes only. Dinner menu selections must be made two weeks in advance. Due to our liquor license, no alcoholic beverages are permitted unless purchased on the premises. You may bring your own prepared food to eat in the outdoor pavilion areas, or you may choose from our catered picnic menu. The pavilions close at 9pm; the clubhouse also closes at 9pm.